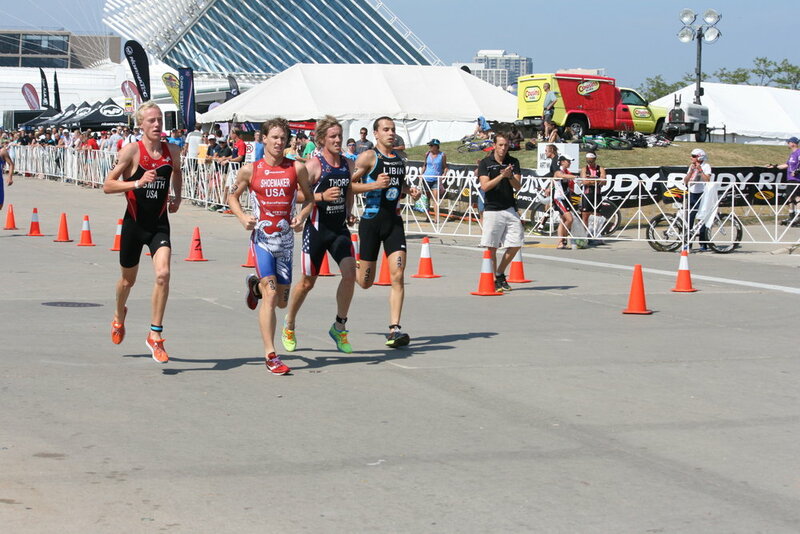 Milwaukee Super Sprint (Aussie Style) #USATAGNC14 — James Thorp. Triathlete. I was chompin' at the bit to have a crack at a super sprint in Milwaukee. I felt my first race of swim, bike, run, swim, bike, run format would give me a good dig at comin' away with the bikkies. Exiting the water in 8th with a long run up to T1 I was going off like a rat in a drain pipe doing my best to get in the lead group on the bike. I went as flat out as a lizzard drinking and dismounted in a great spot just a few ticks off the clock back from the actual Starky but in the main lead pack. Onto the run and I was going bananas. We managed to close the gap and pass Starykowicz pretty quick before a group of 4 of us were left at the front of the race entering T3. Things started to go downhill quickly from there. I couldnt get my cap on for the second swim given I was sweating like a bag of cats at a greyhound meet. This left me as a mad as a cut snake diving into the water in 5th behind Starykowicz. From there I made my second mistake of the day losing Andrew's feet after I thought we weren't swimming as straight as we could. I felt like a Galah exiting the water in 6th behind Ben Collins and Starykowicz as we headed into T4. I must have had a few kangaroos lose in the top paddock mounting my bike as I hopped on a smidge too early which would end up costing me a 10 secound penalty. I hammered the 2nd bike but there was no one within cooee and I was left between two groups on the road riding solo. T5 was an absolute disaster. I had massive issues getting out of my shoes to dismount as one of them had managed to velcro itself during the bike. I was sweating like a gypsy with a mortgage in T5 and have to thank Sara for saving me from another 10sec penalty after trying to rack my bike the wrong way. That shocker in T5 left me exiting with transition with the group that was riding behind me. Thankfully Justin Roeder and I were able to gap the other guys pretty quick on the run before I had to serve my penalty after the first lap. I felt like the arvo was going to waste as I stood in the penalty tent but I went on a tear after that and finished in 7th place behind Justin. Despite being a bit disappointed with my second go round, I can take confidence for Kelowna next week after leading the race into T3 in a strong field. I have to thank everyone that was out there cheering for me in Milwaukee. I have never had so much support in a race. I had a blast hanging out with A3, Every Man Jack, and Team Toledo athletes. Big congrats to all the EMJ boys for some awesome results in MKE. Special thanks to the Denny family for the photos too! Finally, a big thanks to USAT for hosting this event, I can't wait to have another crack at it.